Bristol midfielder Caroline Weir hopes the club use their Continental Cup form to improve their league position. 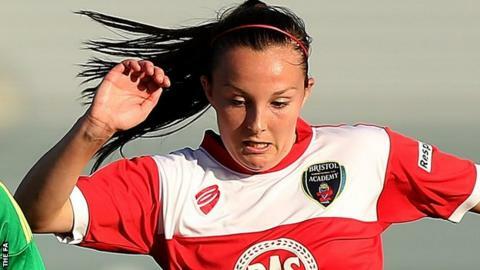 The Vixens are top of Group Three after a 3-0 victory over Yeovil, their second straight cup success, but they are winless in Women's Super League One. "It's good to get a win under our belts and it gives us confidence having a winning streak," said the 20-year-old. "We are having a tough time in the league at the moment, so it's good to get some wins and score some goals." Sharla Passariello opened the scoring against WSL 2 side Yeovil after 12 minutes, with Weir doubling the advantage before half-time and Christie Murray adding a third late on. "We weren't underestimating Yeovil at all - they have a number of ex-Bristol players in their side - so we knew what to expect," added Scotland international Weir. "They are always a tough team to play against. It's a tough surface to play on as well - but it was a good result in the end." In Group Three's other fixture, Birmingham City recorded a 7-1 victory against local rivals Aston Villa to move second behind Bristol. Jo Potter and Remi Allen both scored twice, while Karen Carney, Kirsty Linnett and Charlie Wellings also got on the score sheet for Blues. Liverpool made it two wins from two in Group Two, as goals from Natasha Dowie, Ashley Hodson and Lucy Staniforth sealed a 3-0 win at Doncaster Rovers.